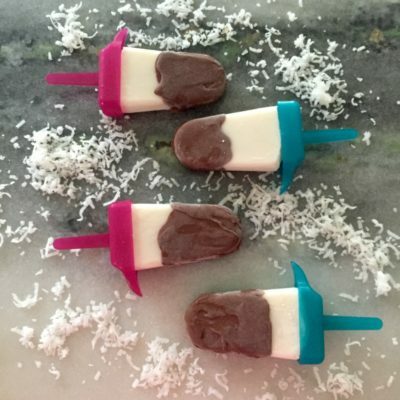 Celebrate back-to-school with these Chocolate Covered Peanut Butter Banana Pops! Easy to make and even easier to eat! This one’s for the kids! It was back-to-school week around the country, so I thought I would share a recipe with kiddos in mind! These Chocolate Covered Peanut Butter Banana Pops would make an awesome after school snack or after dinner treat! It’s September, but it still feels like the middle of July so frozen treats are still totally in style! Your kids will love helping you out in the kitchen to make these! Start by peeling the bananas, trim off the ends and then cut them in half. Holding the banana halves by their ends, cover the outside in a thick coat of peanut butter. 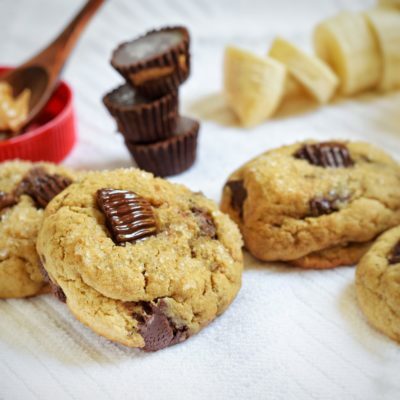 Line a baking sheet with a piece of parchment paper and lay the peanut butter covered banana halves on the sheet so none of them are touching. Insert a popsicle stick halfway into each banana. Put them in the freezer for at least 1 hour. When bananas are frozen, melt the chocolate and coconut oil and set up your toppings. 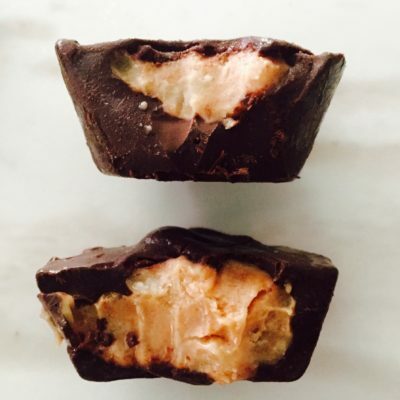 Dip each peanut butter covered banana pop into the chocolate, use a spoon to help fully coat. Sprinkle with toppings. Lay the pops back on the baking sheet and put them back in the freezer to set, at least 1 more hour. Store in the freezer and you have a grab-and-go snack!